Current Red Sails Inn owner Bill Dargitz poses with early photos of the Red Sails Inn at its original location on the Embarcadero at G Street, where it operated in the 1920s and ’30s. The restaurant will close its doors on Aug. 31 after a nearly 60-year run at its Shelter Island location. New owners The Brigantine Inc., which operates two other restaurants nearby, will remodel the restaurant and reopen it as The Ketch. If you, like me, are concerned at the galloping pace of the Port of San Diego Board of Commissioners’ efforts to redevelop so much of the San Diego waterfront — seemingly with little public input — news that the Red Sails Inn on Shelter Island is closing after nearly 60 years is troubling. The Red Sails will serve its final meals Aug. 31, when the sale to The Brigantine closes. A funky but endearing fixture of the “working waterfront,” patronized by generations of boatyard workers plus boaters of every stripe, the memorabilia-laden Red Sails Inn moved to its current location on Shelter Island in 1957 from downtown, following an earlier incarnation along the Embarcadero that opened in the 1920s. Current owner Bill Dargitz reluctantly relocated from Seattle 23 years ago to help his father, Jack, run the Red Sails three years after Jack had bought half interest in the venerable restaurant. Dargitz, now 54, had grown up in and around Jack’s restaurants and made a career in the hospitality industry. Red Sails and San Diego quickly became home; gradually he bought out his dad’s partner. Jack, 77, retired eight years ago but retains an interest in the restaurant. Customer loyalty is a hallmark of the Red Sails, many of whose patrons come several times a week or return on regular visits. That’s how I first experienced the Red Sails. My husband, who’d discovered the restaurant as a Navy midshipman, introduced me to his sentimental favorite on my first San Diego visit. “The cool tradition is that we have people come here with little kids who say ‘I was this big when I first came here,’ ” Dargitz recalled. Selling the Red Sails is bittersweet for both father and son. “We didn’t start the Red Sails. But we didn’t think we’d end the Red Sails, either,” he said. Dargitz had hoped the new Brigantine owners would retain the name, which conveys with the sale, as does much of the memorabilia. Instead they are rebranding it The Ketch, first of their newest chain. The Brig owners have pledged to give Red Sails’ employees, many of whom have worked there for decades, priority in hiring when the restaurant reopens after an extensive remodel, but the staff is justifiably anxious after the shock of losing their jobs. Rumors of a sale had long swirled around Point Loma. The Dargitzes’ decision to sell was triggered by Anthony’s losing its lease on the Embarcadero location after 50 years. “The port seems to put everything up to bid now. That scared us,” he said, remarking that they’d almost lost their lease last time, but were saved by the arrival of new port negotiators who appreciated the restaurant’s long tradition. Although 12 years remained on their lease they feared losing the entire value of their business if they waited to sell. When the Red Sails pours its last drink on Aug. 31, San Diego will lose yet another slice of its rapidly dwindling maritime heritage, along with all the closed old joints, marine businesses and much of Shelter Island’s disappearing Tiki-inspired architecture. The Red Sails was an unpretentious, comfortable boaters’ hangout that was, yes, badly in need of a facelift. Yet the loss of this icon represents much more than the closure of just another restaurant: it’s another milestone in the loss of our maritime heritage. Historic preservation, done right, makes good business sense. Let’s protect our maritime heritage while preserving traditions and services essential for thriving marine and boating industries. Maybe the Spanos family and the Brigantine family should get together and build a stadium since they have folks in their back pocket!! Nice article Capt.!! The Red Sails Inn was a home away from home for me when I would come to San Diego to study for my Coast Guard License upgrades and renewals. The food was always dependable, great value for the price. The staff were always welcoming and who could not love having the fireplace going on a cold, rainy morning. I don’t know why this nation seems to want to destroy our Maritime heritage. Some things and traditions need to be kept and places like the Red Sails Inn was one of them. Wishing the owners and staff the best. You will be missed. You can never be replaced! This is heartbreaking, my husband and I discovered Red Sails 34 years when visiting San Diego. When we moved here 32 years ago, we had breakfast there every weekend as our we raised our children. We just started taking our grand children there a few years ago, I can’t believe they won’t grow up skipping around the fountain like my kids! 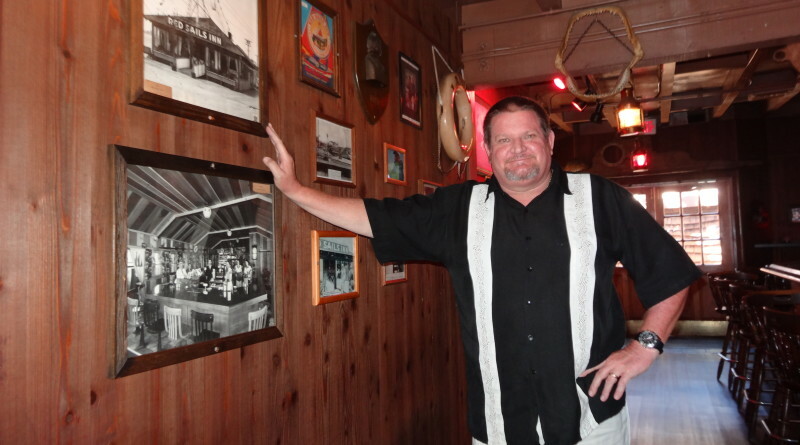 I loved their food and charm of the interior…another small town San Diego icon gone. I doubt I’ll even try the Ketch or whatever they call the new restaurant and I’m sure they won’t served chipped beef on toast…argg what is the world coming to? Hi Pam, my wife and I discovered Red Sails, Jack and Bill 23 years ago and had breakfast there every weekend too. We probably would recognize each other. Our kids ran around that fountain too. Our son even fell in once! We loved the place and the people so much that we got married there. Outside on the deck. We were the only couple to ever get married at Red Sails. It was perfect. You are right. Heartbreaking. My uncle introduced us to the Red Sails when he lived on his sailboat in the 60’s. We have many fond memories and will really miss those hush puppies. I have been visiting Red Sails for most of my life (I’m 35). My grandfather was a yacht club member and used to take me here all the time. Our favorite was the crab salad. This has become my favorite place to dine, and I have been coming here on my birthdays each year. I was shocked and saddened to hear of its closing. I don’t know what to say, other than times are changing. Old, family run restaurants are being pushed out by corporate chains, and it’s a damn shame. I will miss this place, and will always remember the great food, historic décor, and the pleasant employees of the Red Sails. Thank you for everything over the years. Went to the Red Sail Inn every time I came to visit my sailboat docked on Shelter Island. When I went to the door on my last visit, it was closed. Next I looked up the story of how the Red Sail Inn had been sold. I used to sit out on the patio and eat breakfast, lunch or dinner. I really miss the Inn and Shelter Island just does not seem the same anymore. No place I go gives me the same feeling. Ultimately I may just Sail away. Thanks for being there; so sad you are gone. boo hoo We live in Kentucky and always love coming to Shelter Island and eating at Red Sails. What a tragedy! Just goes to show you that big bucks always win. Shame on those who want to take away history and develop something that is precious to so many into something that has no feelings, no memories to so many. I’ll never contribute to your greed in any way… wow I know that means a lot to you, but if there are millions more that agree with me, then that’ll make a huge difference. I worked at the Red Sails in mid-’70s in the Oyster Bar. An Abalone Sandwich was $2.95. We had a girl’s Soft ball team: THE RED SNAPPERS. I was on their Bowling Team. Is there a remaining photo Post Card of Red Sails? I was on it~ Good times! We come down every other summer from Orange County. We stay at Humphreys and loved coming for cocktails in the eve and breakfast grub in the a.m. we were really sad to se that it’s gone. Such history… old charm… and retro in the boating community… gonna miss it..so bummed!